Judging from our mail, this is the most popular of all Brokeback locations. How fortunate that Upper Kananaskis Lake is easy to visit and breathtakingly beautiful in its own right. If your travel plans permit, avoid coming here on summer weekends when the area tends to be busy with vacationers, picnickers, and boaters who seem oblivious to this site’s Brokeback credentials. Weekdays are fine. Sunrise is a particularly lovely, serene time to visit and photograph this special place. 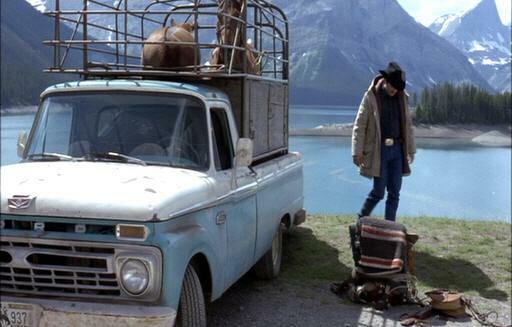 Most Brokeback fans are surprised that the area where Ennis and Jack stand is some 25' above the lake level. A steep grassy bank, not visible in the film, separates the spot where Jack stood from the water’s edge. Of course, the added elevation affords a much more expansive shot of the mountains and lake, which all agree is the crown jewel of the Kananaskis Lake Group.